Mercury is the closest planet to our Sun. It is named for the ancient Roman god of trade and profit. Legend says Mercury's winged sandals gave him super speed. Mercury the planet is super fast, too. It zips around the Sun every 88 days - faster than any other planet. Mercury's elliptical orbit takes the small planet as close as 47 million kilometers (29 million miles) and as far as 70 million kilometers (43 million miles) from the Sun. If one could stand on the scorching surface of Mercury when it is at its closest point to the Sun, the Sun would appear almost three times as large as it does when viewed from Earth. Temperatures on Mercury's surface can reach 430 degrees Celsius (800 degrees Fahrenheit). Because the planet has no atmosphere to retain that heat, nighttime temperatures on the surface can drop to -170 degrees Celsius (-280 degrees Fahrenheit). Because Mercury is so close to the Sun, it is hard to directly observe from Earth except during twilight. Mercury makes an appearance indirectly, however 13 times each century, Earth observers can watch Mercury pass across the face of the Sun, an event called a transit. These rare transits fall within several days of May 8 and November 10. The first two transits of Mercury in the 21st century occur May 7, 2003, and November 8, 2006. Scientists used to think that the same side of Mercury always faces the Sun, but in 1965 astronomers discovered that the plan-et rotates three times during every two orbits. Mercury speeds around the Sun every 88 days, traveling through space at nearly 50 kilometers (31 miles) per second faster than any other planet. The length of one Mercury day (sidereal rotation) is equal to 58.646 Earth days. Rather than an atmosphere, Mercury possesses a thin exo-sphere made up of atoms blasted off its surface by the solar wind and striking micrometeoroids. Because of the planet's ex-treme surface temperature, the atoms quickly escape into space. With the thin exosphere, there has been no wind erosion of the surface and meteorites do not burn up due to friction as they do in other planetary atmospheres. Mercury's surface resembles that of Earth's Moon, scarred by many impact craters resulting from collisions with meteoroids and comets. While there are areas of smooth terrain, there are also lobe-shaped scarps or cliffs, some hundreds of miles long and soaring up to a mile high, formed by early contraction of the crust. 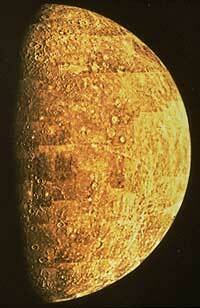 The Caloris Basin, one of the largest features on Mercury, is about 1,300 kilometers (800 miles) in diameter. It was the result of an asteroid impact on the planet's surface early in the Solar System's history. Over the next half-billion years, Mercury shrank in radius about 1 to 2 kilometers (0.6 to 1.2 miles) as the planet cooled after its formation. The outer crust contracted and grew strong enough to prevent magma from reaching the surface, ending the period of geologic activity. 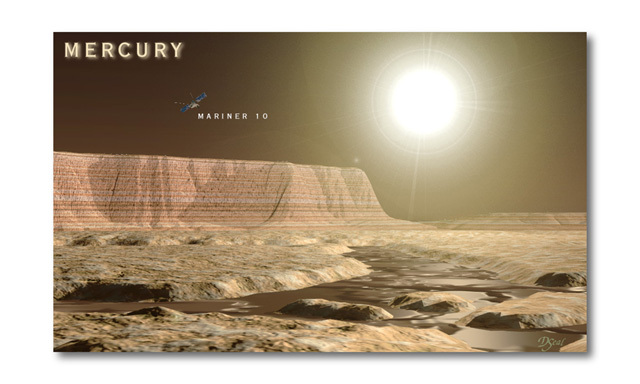 Mercury is the second smallest planet in the Solar System, larger only than previously measured planets, such as Pluto. Mercury is the second densest planet after Earth, with a large iron core having a radius of 1,800 to 1,900 kilometers (1,100 to 1,200 miles), about 75 percent of the planet's radius. Mercury's outer shell, comparable to Earth's outer shell (called the mantle), is only 500 to 600 kilometers (300 to 400 miles) thick. Mercury's magnetic field is thought to be a miniature version of Earth's, but scientists are uncertain of the strength of the field. Only one spacecraft has ever visited Mercury: Mariner 10, which imaged about 45 percent of the surface. 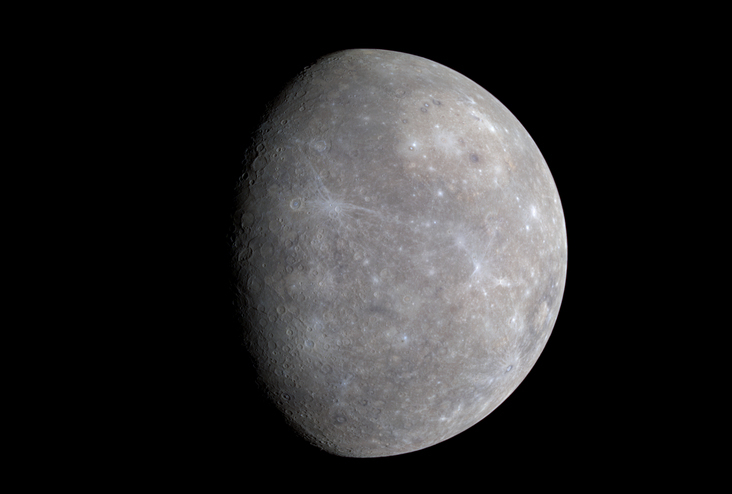 In 1991, astronomers using radar observations showed that Mercury may have water ice at its north and south poles inside deep craters that are per-petually cold (below -212 degrees Celsius or -350 degrees Fahrenheit). Falling comets or meteorites might have brought ice to these regions of Mercury, or water vapor might have outgassed from the interior and frozen out at the poles. By Comparison: Earth is 1 A.U. (Astronomical Unit) from the Sun. By Comparison: If you weigh 100 pounds on Earth, you would weigh 38 pounds on Mercury. By Comparison: Earth's equatorial inclination to orbit is 23.45 degrees. By Comparison: Earth's temperature range is ~ 185/331 K.
The MESSENGER spacecraft completed its third and final flyby of Mercury on 29 September 2009, concluding its preliminary reconnaissance of the innermost planet. The mosaic was designed to use to plan observations during the orbital phase on MESSENGER's mission. The challenge was to make cartographically accurate maps from a series of images with varying resolution (from about 100 to 900 meters per pixel) and lighting conditions (from noontime high Sun to dawn and dusk) taken from a spacecraft traveling at speeds greater than 2 kilometers per second (2,237 miles per hour). In the final bundle-block adjustment the average error was about two-tenths of a pixel or only about 100 meters - which is an excellent match from image-to-image. The biggest remaining issue is the absolute control of features on the surface. For instance, if the north pole is not precisely at the spin axis you could have a mosaic in which all the seams overlapped perfectly, but the whole mosaic could slide around like the skin of an orange that somehow became detached from the interior fruit. 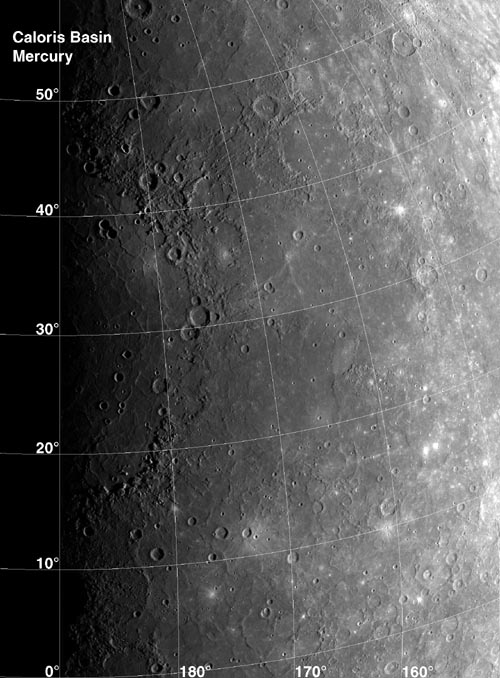 Absolute positional errors in the new mosaic are about two kilometers, according to the MESSENGER team. 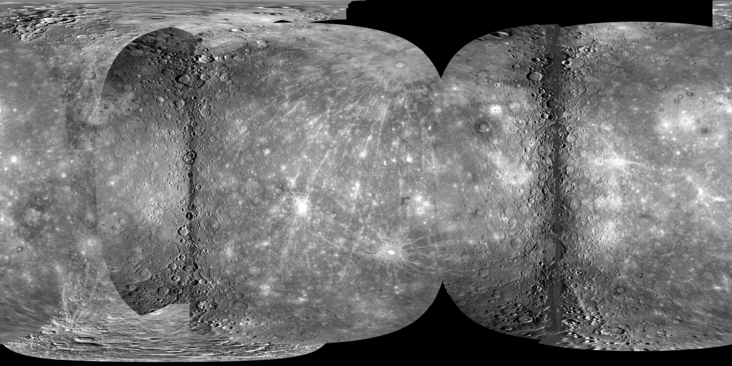 Once the MESSENGER spacecraft orbits Mercury, much progress will be made refining the relative and absolute control of the MESSENGER (and Mariner 10) images, and the entire planet will be imaged at even higher resolution. The global mosaic is available for download on the USGS Map-a-Planet web site, http://www.mapaplanet.org.